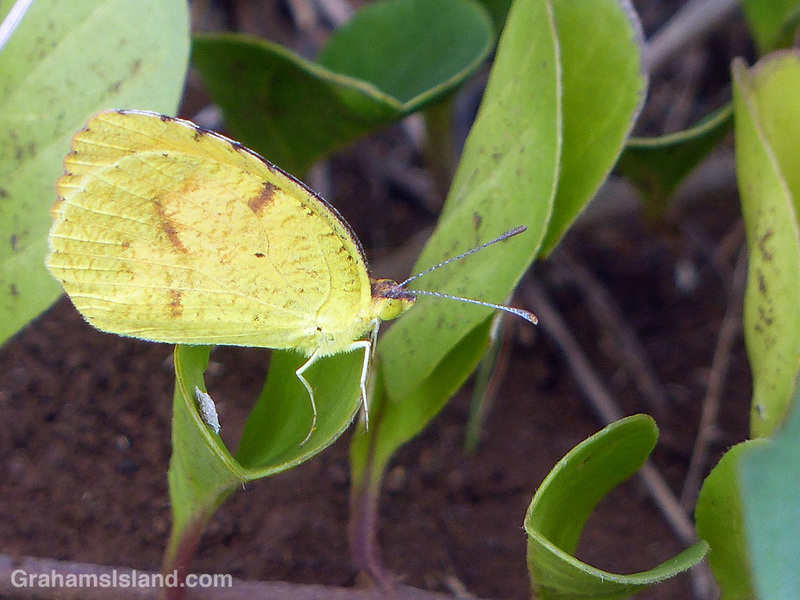 The sleepy orange butterfly (Abaeis nicippe) is one of the newest introductions to Hawaii. It was first seen on Oahu in December 2013 and is already established on all the main Hawaii islands, an unusually rapid spread. Part of its success in thriving here might be that has a wide range of habitats where it can live. It’s been spotted from sea level all the way up to 6,800 feet. While its name is sleepy orange, like most of the butterflies I see here, it’s a rapid flier, jitterbugging around in such a way that it’s hard to capture in flight. Fortunately for me, this one was jitterbugging in 30 m.p.h. winds and seemed happy to take any opportunity to find a sheltered spot to rest.